So what do we listen for when judging the sound quality of a loudspeaker or a complete audio system? Firstly, the overall tonal balance. The bass, midrange and treble parts of the audio spectrum should sound in balance without any part being too loud or too quiet. If the bass is set too high the speaker will sound 'thick' and 'boomy'; if the tweeter is set too low the speaker will sound too 'dull'. If the midrange is set too low the sound will seem rather 'distant', and if it is set too high the sound will appearrather 'forward'. The bass needs to be extended in keeping with the size of the speaker, and the treble should similarly reproduce the very highest frequencies and bring across the sense of 'air' in a real sound without any exaggeration. Clearly, subjectivity comes into play when describing the sound, but it is part of the skill of the loudspeaker designer to be able to relate the sound to the measured response and to know what to adjust in the response to improve the sound. Next we will listen for the quality of the sound. We like the bass to be 'solid', 'clean', 'tight' and 'deep' with good 'timing' - it is surprising how a loudspeaker can change from being exciting to being boring after a seemingly arbitrary change to the bass response.The midrange should be open and detailed without being 'forward' or 'hard' so that voices are natural sounding and musically convincing. The treble should be natural sounding and transparent without being 'edgy', 'harsh' or 'contrived'. The sound should be free from obvious colourations or distortions that can spoil the reproduction. The stereo image should be accurately formed between the speakers. Instruments should not change their apparent location as they play different notes. Instruments and voices that are set to be central in the image should be exactly that - rock solid and believable - and should not move in an unnatural way as the listener moves from side to side. Orchestral and choral music should have a realistic physical scale and a good sense of the reverberance and acoustic character of the recording venue - one should get a real sense of the different individual voices and instruments that make up a full ensemble. Finally we have dynamics - the ability of the speakers to accurately reproduce the changes in level of the recorded music without any obvious distortions. This means not only the ability to play a sound loudly without stress or harshness, but also the ability to bring across the subtle changes in the most delicately played pieces. When it all comes together we have a really great loudspeaker. 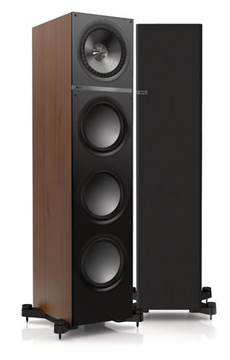 For most of our loudspeakers, designing to a cost target is a very important consideration, and we will attempt to give the customer the best combination of these qualities that we can within this constraint. In general, the qualities we aim for in a loudspeaker are independent of its application - we try to ensure that the KEF philosophy is apparent in all of our designs. However, there are some applications for which we would pay particular attention to certain areas.